It was September 18th and my boyfriend and I had tentative plans to go to The Colombia (a Florida and specifically, Ybor City, staple) for their 1905 day where all menu items revert back to the prices from 1905, when The Colombia first opened their doors. Unfortunately, I was scheduled to work at the last minute and given that lines are usually pretty long and tiresome, we knew we wouldn't make it in time for dinner. Instead, I decided to treat him to Burger 21, rated the Best Burger in Tampa Bay by Creative Loafing Magazine. I had been here once before with some friends and remember thinking that I had never tasted a burger quite like the one I had. I knew Mike would enjoy it just as much. The first time I visited, I opted for The Shroom, a burger with lettuce, tomato, sauteed crimini mushrooms and onions, and fontina cheese, served on a brioche bun with garlic butter. 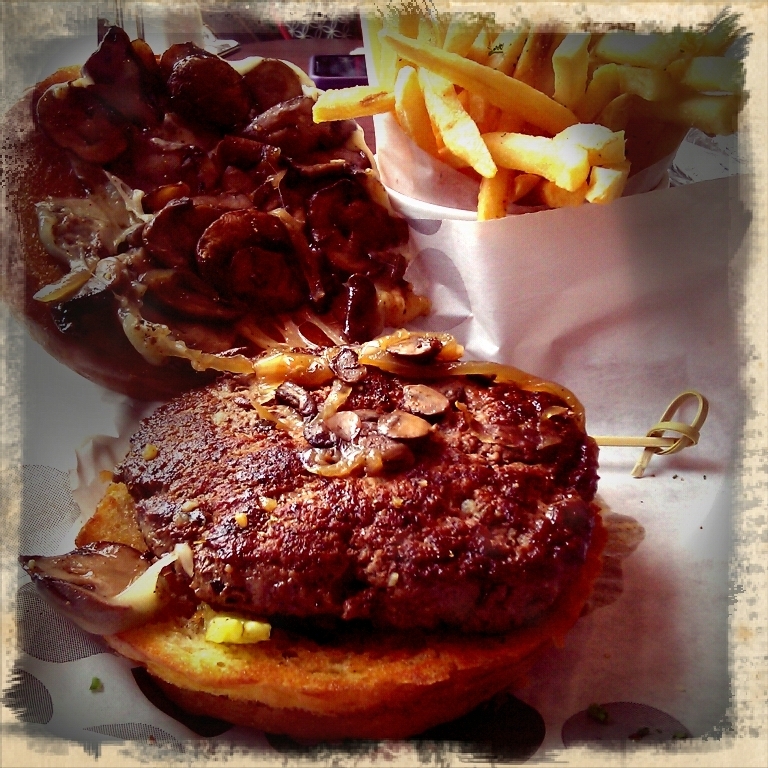 I loved that the burger was overloaded with mushrooms (one of my favorite things to eat). The bun was crispy and had the perfect flavor. I didn't feel like I had to add any condiments to enhance the flavor of my burger either. This second time, as much as I wanted to re-order The Shroom, I decided to try something else. I decided on the BBQ Bacon Burger, topped with lettuce, tomato, applewood-smoked bacon, cheddar cheese, crispy onion strings, and sweet hickory barbeque sauce, on a sesame bun. I don't think it's possible for this burger to get any juicier. Normally, I keep away from BBQ burgers. As much as I love BBQ sauce, I find that a lot of burger places just overload and that ends up being all you can taste. Because I had such confidence in Burger 21 to deliver an amazing burger no matter what the ingredients, I wasn't worried. And, I wasn't disappointed. 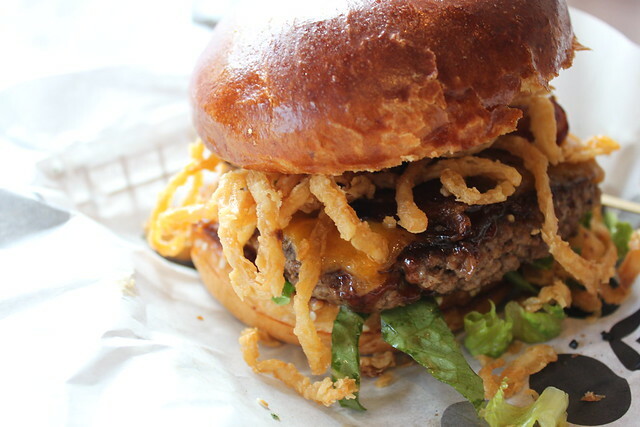 This burger has the perfect combination of crispy (just adding onion strings increases my pleasure in consuming food items by, oh, about 100%), savory, and sweet. Mike ordered the Tex-Mex Haystack, which comes with lettuce, tomato, applewood-smoked bacon, smoked cheddar cheese, guacamole, crispy onion strings and chipotle-jalapeno sauce on a brioche bun. Unfortunately, he devoured it too quickly and I did not have time to take a picture. Suffice it to say that it was beautiful and amazing. By the way, if you are in love with the idea of condiments, like I normally am, Burger 21 offers a wide array of different sauces (8 in total). With my shoestring fries, I tried everything from Toasted Marshmallow to Chipotle Mayo to Thai Ketchup to Apple Cider. Burger 21, aptly named due to their 21 different burgers available, offers beef, chicken, turkey, veggie, shrimp, and tuna burgers. They offer sliders, hotdogs, and salads. They also offer regular and sweet potato fries, which I recommend you visit the Sauce Bar to complement. Finally, they offer hand-dipped floats, malts, shakes and sundaes. Burger 21 comes highly recommended by many visitors. Located in Westchase and soon opening in Carrollwood, I can promise that it will become a "must visit" restaurant in the Tampa Bay area. I will have to try this place next time I am in town visiting my wonderful neice! Ooo La La!! !